Black Holes—The Universe’s Prima Donnas? New research shows black holes cannot grow indefinitely, sparing the cosmos from eventual consumption. “I am so much in awe that I always spell ‘Universe’ with an uppercase ‘U,’” says Yale astrophysicist Priyamvada Natarajan. The capital letter pops out when Natarajan speaks, especially when she talks about her research involving the universe’s most exotic and massive marvel—the black hole. Black holes are “perhaps the universe’s biggest prima donnas,” says Natarajan. According to the prevailing theory, black holes are bottomless pits growing in size and strength as matter falls into them until there is nothing left to consume. However, Natarajan and her colleague astrophysicist Ezequiel Treister, of the European Southern Observatory in Chile, have determined that this picture of the boundless black hole seems to be exaggerated. Their theoretical research reveals black holes have a size limit, or a maximum possible mass. This turns out to be around 10 billion times the mass of the Sun—similar to the difference in mass between the Hoover Dam and a standard brick. This size limit implies that despite its almost unimaginable size and power, a central black hole will never devour its host galaxy. A black hole is a celestial body so massive that its gravity is strong enough to trap even light, the fastest moving thing in the universe. Imagine a bowling ball creating a depression on a large trampoline. Marbles rolling slowly along the surface of the trampoline near the bowling ball will eventually end up in the funnel-like indentation. As slow moving marbles gather at the center, the depression becomes incrementally deeper, making it possible to capture faster marbles. Taken to the extreme, the depression becomes so deep that even the fastest marbles cannot roll past it. This is a black hole. By this logic, as long as a black hole has something to absorb—like particles of gas and dust in the cosmos—it will continue to grow. What Natarajan and Treister have shown in their paper, published in the October 15 edition of the journal Monthly Notices of the Royal Astronomical Society, is that it is possible this release of energy will actually disrupt the flow of matter into a black hole. 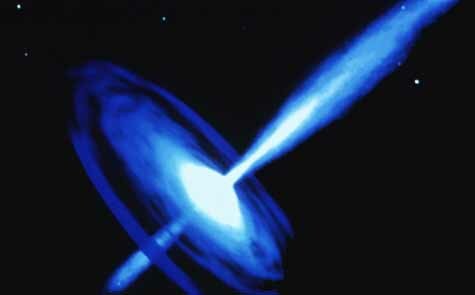 The energy spouted by a black hole is like a spray of foam from the center of a powerful whirlpool. At low levels, this spray does not have much effect, but at higher energies the spray will prevent the leaf from ever reaching the whirlpool’s center. If the spray is sufficiently strong, it will even push the leaf back into the river, with no chance of the whirlpool capturing it again. This finding has important implications for the formation of galaxies as the universe cooled after the Big Bang, says Karl Gebhardt, an astrophysicist at the University of Texas in Austin who was not involved in the research. Researchers think black holes reside at the center of almost every large galaxy, including our own, the Milky Way. And as it turns out, the size of the central black hole is proportional to the size of the galaxy itself. “What we are really learning here is how large a galaxy can be,” says Gebhardt. By knowing the maximum size of galaxies and measuring their distribution, scientists can learn some fundamental properties about the early universe, like the distribution of matter and the size of the density fluctuations that evolved into stars and galaxies. Like supporting actors in a play, black holes work with the rest of the cast and are integral in telling the story of the universe. Maybe black holes are not prima donnas after all. How could everything in the universe come from the Big Bang? The best evidence yet for dark matter comes from colliding galaxies. YAAAAAAAAY I”M THE FIRST PERSON TO COMMENT! THIS AKES ME SO HAPPY I THINK I”LL GO LICK A WINDOW! ukay I’m second to comment but I know I am the first from Kenya if somebody knows where that is.Science is really not my line but I just wanted to get through to Erik and I dont have his address.Could anybody tell him that for me. 1/ At the blackholes core or the netron-stars core, Is it that lights from inside to outside cannot escape to gravitation area? Is it we cannot observe to that lights because that light-speed are zero or negative? 2/ So, if other star’s lights irradiation to the gravitation area of blackholes or netron-stars, Is it that lights finally show double light-speed because gravitation of blackholes or gravitation of netron-stars that it’s suction to that lights from single light-speed accelerated to double light-speed? 3/ If the E=MC2 is right, the metamorphose equation M=E/C2 from E=MC2 is right too, Is it that light-speed can be accelerated to square of light-speed? Is it very powerful energy can be creating objects when It’s speed reaches square of light-speed? In black holes gravitational force attracts electromagnetic force inside the black holes. It is evident that the magnitude of gravitational force in black holes is much higher as compared to that of electromagnetic force. In fact the speed of gravitational force in black holes is also many times higher than the speed of electromagnetic force. Only on this account even light can not escape black holes. Escape velocity at black holes is many times higher than the velocity of light. Light does not emit from the black holes. Gravity waves emanate from the black holes. At the time of such emission the speed of gravity wave should be also much higher than the speed of light ‘c’. In fact light is the manifestation of action of gravitation force at the time of birth of a star. Before the birth of a start there is no light. There is only force of attraction or cohesion force or we may call it gravitation force (Newtonian). In persian we call it quvat-i-zazba. His Holiness Huzur Maharaj, Second Spiritual Head of Radhasoami Faith had call it the Prime Ingredient of the Universe. The entire Universe has been created and sustained through it and when this current withdraws the universe collapses. Apropos an article on Logic of Reincarnation by Steven J Rosen published in The Speaking Tree of 11the July 2010. In this article the author enquires what is it that reincarnates from one body to another? Is it the soul? the mind? the intellect? To understand this we should suggest answer to these questions. We all know that there are four fundamental forces in the universe viz., gravitation force, electromagnetic force, weak nuclear force and strong nuclear force. I have written a paper entitled ‘Gravitation Force is the Ultimate Creator’ and presented it at the 1st International Conference on Revival of Traditional Yoga held in Lonavla Yoga Institute, Lonavla in January 2006. In this paper I have defined soul (individual consciousness), mind and body. According to this every point of action of Gravitational Force Field is individual consciousness or soul, electromagnetic force as the force of mind and weak and strong nuclear force as the gross material force which constitute physical frame of body. “Just as an age was once ready to receive the Copernican theory of the universe, so is our age ready for the idea of reincarnation to be brought into the general consciousness of humanity”. Now I give Radhasoami Faith view of Creation Theory. In Sar Bachan (Poetry) composed by His Holiness Soamiji Maharaj the August Founder of Radhasoami Faith the details of creation and dissolution has been described very scientifically. It is written in this Holy Book: Only He Himself (Supreme Father)and none else was there. There issued forth a great current of spirituality, love and grace (In scientific terminology we may call this current as gravitational wave). This is called His Mauj (Divine Ordainment). This was the first manifestation of Supreme Being. This Divine Ordainment brought into being three regions, viz., Agam, Alakh, and Satnam of eternal bliss. Then a current emerged with a powerful sound. It brought forth the creation of seven Surats or currents of various shades and colours (in scientific terminology we may call it electromagnetic waves). Here the true Jaman or coagulant was given (in scientific terminology this coagulant may be called as weak nuclear force and strong nuclear force). Surats, among themselves, brought the creation into being. These currents descended down further and brought the whole universe/multi verse into being i.e. black holes, galaxies etc. were born.